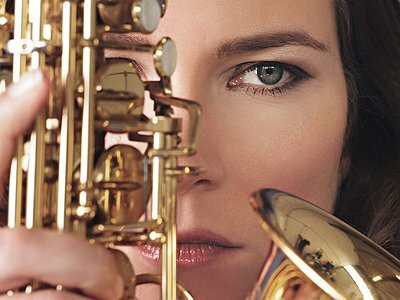 Website / Contact: If you enjoyed this interview with Susanne Alt, you can find more information about her on her website. I started to play the saxophone at the age of 12, after having gotten lessons by my parents on piano (age 6-10) and guitar (age 8-11). My first impression of the saxophone was an American bigband with female saxophone players, performing in my home village, Estenfeld near Würzburg, Germany. Coming from a classical household I didn’t have all that many other childhood saxophone influences, but when I was 13, 14 and discovered Charlie Parker and later Joshua Redman and Maceo Parker, I was hooked. Very much this way. While learning classical saxophone, I started listening to jazz. I started reading jazz history and harmony books and biographies of jazz musicians. Also I attended local jam sessions, first listening and later playing. Watching the older guys and learning about the rituals of a jam session. Having classical saxophone lessons by my teacher Günter Priesner who paid a lot of attention to sound, as well as my music teacher parents who also paid a lot of attention to the importance of a good sound I developed an own sound quite soon. The vocabulary has been developing since. As a jazz musician you always keep wanting more in your solos, developing language, stretching out or sometimes going back to simplicity, depending on the musical environment. Despite having owned great instruments, I would say the saxophone mouthpiece is the most important part, the reeds and mouthpiece, not the saxophone itself. I am very practical about equipment, although I get attached to my instruments. But in the end the main thing is that the instrument works and is in tune. I believe I can do my thing on any properly working saxophone. I think musicians should focus more on their own technique than searching for equipment all the time. I don’t know. I think it’s more my own development which made me decide the next steps. I recorded 3 studio jazz albums with my band, then a live album with that band, then an album which went more into soul/funk but still played by my jazz band and after that I took some time to develop a funk band sound which of course has jazz influences. I think it was a natural development. I think that I have to be happy about my steps in music rather than following other people’s footsteps. The music industry has changed a lot so following saxophone players from other periods in time doesn’t make so much sense. I still find it hard to be a band leader and sometimes give orders about how the music should be played. But it’s the only way. Unfortunately band members cannot look in each other’s brains. Furthermore, I think the challenges as an artist are more of practical kind, dealing with contracts, administration and doing business. Improvisation is vital in jazz. Composing and arranging are vital for putting a show together. The great thing with improvisation: Sometimes pure magic is made but sometimes it can happen that a solo goes nowhere. It’s the risk and the beauty of spontaneity. Compositions and arrangements are necessary to build a foundation for individual expression and/or improvisation. So in my eyes composing and improvisation are always connected. I only can answer this with being a bit boring: Preparation is everything! I underestimated this factor a lot in the past. Jazz looks as though it's purely spontaneous, but it should be well-rehearsed. If you know the music inside out you can relax and really play with the momentum of sound, space and performance because every gig will be different anyway. So you can let go of the rehearsed form and open it up or stick to it, depending of the acoustics and feedback of the audience or the circumstances of the festival. Sometimes I change the whole set list on the spot if I see how the circumstances are. Is there more space for quiet tunes or are people standing ready to dance and does it require to play a bit more funky? "I think musicians should focus more on their own technique than searching for equipment all the time."